It was quite an exhausting weekend as our family spent most of it on our feet working on preserving fresh summer produce. At least we didn't have to begin by picking the fruit ourselves as they did in the old days and thankfully, we have plenty of delicious creations to show for our hard work! After his early morning half-marathon run on Saturday, hubby and I drove to Fairfax to gather up the currants waiting for us at the Farmers’ Market. 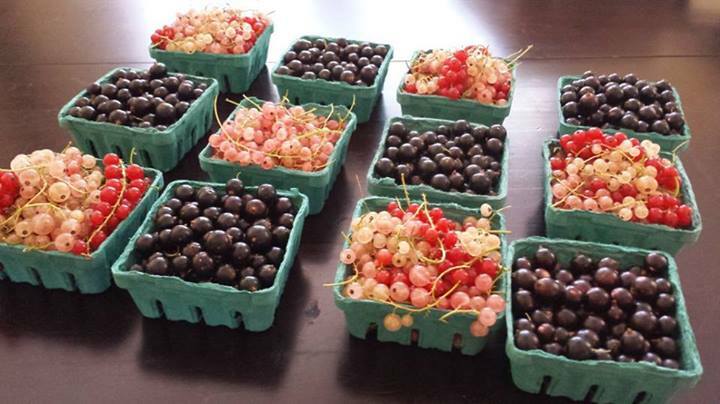 Kuhn Orchards (operated out of PA) is one of the only available sources for currants in the metro DC distribution area. We picked up 6 pints of black currants and 6 pints of mixed currants – red, white, and pink. White and pink are merely pigmentation variations of the red while black currants are quite different (larger and tarter). 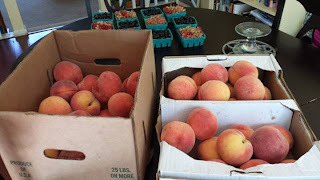 We also stopped by the Manassas Farmers’ Market to pick up 30 pounds of ripe fresh peaches for preserving (on sale for less than a dollar a pound!). Our first task was to sort and stem the currants. A portion of the red currants was aside for a red currant and peach crisp, another portion of red currants was mixed with pink currants and set aside for Jonathan's mixed berry shortcake, a 3rd portion of red currants was set aside with a large portion of the black currants for black and red currant French macarons and the remainder of the black, pink, and white currents were reserved for jam. I put on some bluegrass music to pass the time away and we finished our task in just under 45 minutes. Immediately following I blanched and peeled nine pounds of the peaches. I spent the next six hours in the kitchen prepping various jams, preserves, and fruit in syrup. The French preserves cookbook I'm using is quite time consuming in its steps (some tasks designated for Saturday, some for Sunday after the fruit prep rests overnight) but well worth the effort. 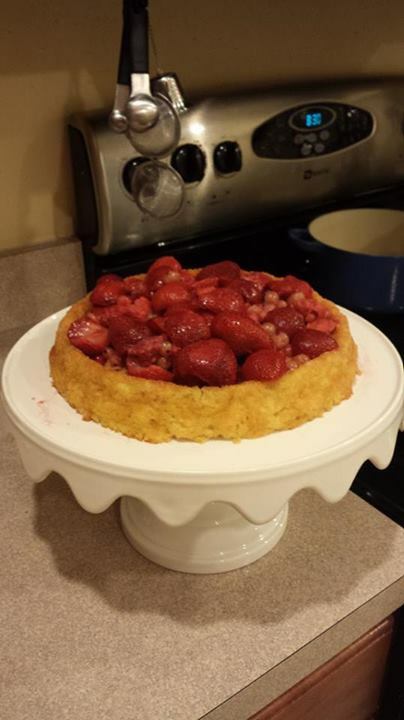 While I worked the preserves, hubby baked an elaborate shortcake to serve as the base for a red currant, strawberry, and raspberry shortcake for Sunday night’s dinner. We also prepped and froze a portion of the currants for future recipes like blackcurrant macarons. After all that work, there was another hour in the kitchen starting at seven p.m. to make empadas (the Brazilian cousin to empanadas). Jon made and rolled out the dough and I made the filling and stuffed the pies. They were pretty tasty. We picked up our work first thing Sunday morning and by nine a.m. hubby and I had finished preparing and canning 6 half-pints of black currant jam, 2 half-pints of white currant jam and 1 half-pint of red currant jam. We also put away 2 half-pints of black currant jam and one quarter-pint of red currant jam in the freezer so that later in the year we can experience the taste differences between canned and freezer preserved jam. One interesting aspect of canning currants preserves: the white and pink currants maintained their beautiful jewel tones even after boiling them down to a thick jam and went into the pressure canner white and pink but came out of it almost as dark as the black currant preserves. 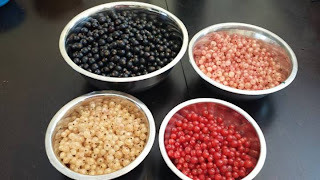 I was able to find an article online that explained this is the normal outcome for white and pink currant jams post processing and the only way to avoid it is to freeze the jam instead of processing it in a boiling water bath or pressure canner. Now we know for next year. After an adventurous outing with our dogs (I’ll be writing about that in another post), we came back to canning in the late afternoon on Sunday. I pitted a pound and a half of fresh cherries and prepped them for preserving before turning my attention back to the peach preserves I had started working on the day before. For the next couple of hours hubby and I worked together on the canning. Our finished products included 5 half-pints of peach vanilla jam, 5 half-pints of peach lavender honey jam and 4 half-pints of cherry jam. Additionally we put up 4 half-pints of plain peach jam for some of our friends who had requested it.And of course hubby's red berry shortcake. Difficulty: I still have more than 12 pounds (half a file box) of peaches left. We are going to slice and freeze a few pounds (for fresh raw peach flavor to add to smoothies, granola, etc. 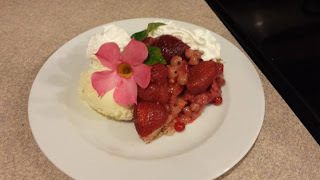 ), slice and can a few pounds in light syrup, and eat the rest fresh this week.